Do you know how to make a vinaigrette? 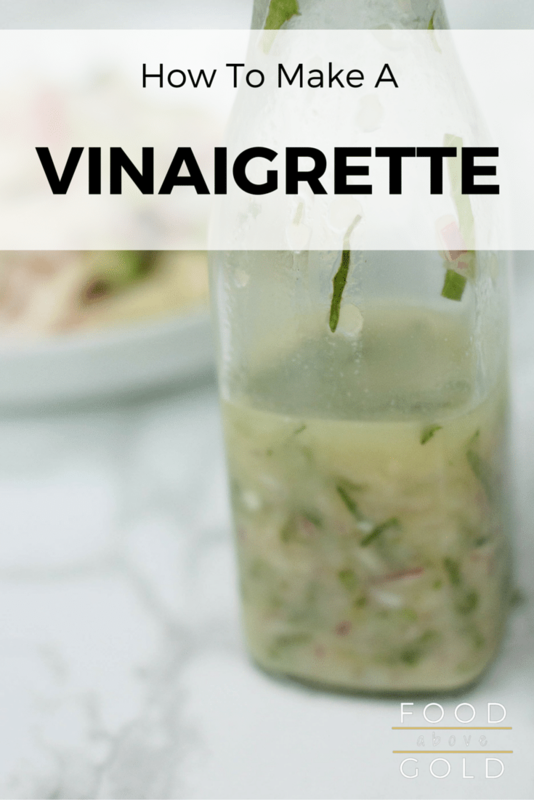 Learn the 3 building blocks of a vinaigrette as well as tips to make it better and recipes to try out your skills. I’m really excited about this month because we are touching on something I love, and hate. Salads. Specifically, spring salads. I love to eat a really good salad, but I get bored with them quickly. You can only eat leafy greens with the same 3 toppings and salad dressing so many times, am I right? In efforts to get my family (really, it’s just me, let’s be honest) to eat more salad, we’ve developed 4 new ones for you to enjoy. But before we move on to tasty recipes, let’s touch on a salad foundation – how to make a vinaigrette! Vinaigrettes are a type of salad dressing where vinegar and oil are the main components. Other ingredients such as herbs and spices may be added to enhance flavor, and sugar is often used to neutralize the acidity. Since oil and vinegar do not combine, they can be mixed together by the process of emulsification – which is using another ingredient – like mustard or egg – to keep them from separating. Remember when we covered making hollandaise sauce and you needed a really slow drizzle of fat into the egg while whisking vigorously to break it into tiny particles? It’s the exact same concept and execution. Want to teach your kids all about the science behind emulsions? Science Friday explains how to run experiments at home so your children can learn while you learn :). Check it out here. Do Vinaigrettes Have To Have Vinegar? While traditionally, that is the case, in the last 30 years or so the vinegar part of vinaigrettes has been stretched to mean any form of acid like lemon juice or lime juice. Additionally, because vinaigrettes separate when left to sit, there are other versions that are built around purées, like tomato, or onion and garlic. These help keep the emulsion in tact for a longer time, versus mustard, which will only last long enough to serve your salad and eat it. Are Vinaigrettes Only For Salads? No, vinaigrettes are a type of sauce that can be used for many other aspects of cooking. In order to serve them hot though, you will need something to help hold the emulsification – like butter. Vinaigrettes can also be great for tossing with cooked vegetables, brushing on grilled meats, tossing with pasta, or as a dip at a party. I personally love to use them as marinades, you just have to be comfortable with the vinegar flavor. Avocado Oil. This one is my favorite because it is relatively flavorless, so it allows the taste of your acids and other ingredients to shine. Nut & Seed Oils. Like Sesame oil (although that one you would want to use sparingly because it has such a strong flavor), grapeseed, walnut, or almond oil. Flavored Oils. You can make these yourself or buy them from the grocery, just make sure to look at what type of oil they used for their base. Vegetable Oils. 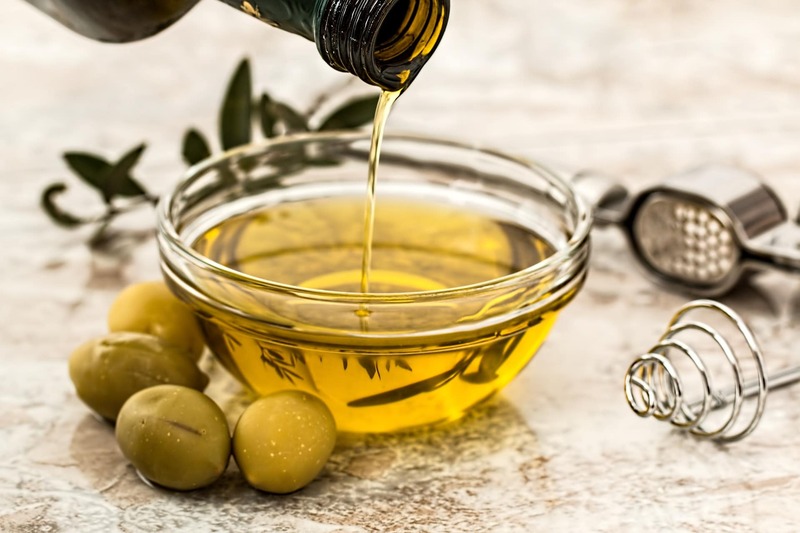 These oils are often used for making vinaigrettes because they are flavorless and come in many varieties, like canola, rapeseed, corn, safflower, sunflower, or just regular “vegetable”. If you have someone you are serving your vinaigrette to that is soy-sensitive, try to steer clear of “vegetable” oil because it is made from soybeans. Coconut Oil. Similar to avocado or olive oil, coconut oil is pressed out of the coconut and is an excellent source of many vitamins and minerals. It can be difficult to work with in a vinaigrette though because it is solid at room temperature. It also has a very strong and distinct coconut flavor. Peanut Oil. It goes without saying, don’t use this if someone is allergic to peanuts, but this oil is great for accenting asian foods. Olive Oil. A favorite of everyone, the earlier the press was on it (extra virgin being the first press), the more delicate it will be. Look for a lighter colored second or third press olive oil to avoid making your vinaigrette bitter. TIP: The more delicate your oil, the less mustard you want to use because it overpowers the flavor of the oil. I do want to recommend that you avoid vegetable oils if you can because these oils often leave a greasy taste in your mouth. Plus, some of the cheaper versions out there have a weird aroma or flavor to them, even though they are supposed to be flavorless. Vinegar is made by allowing sugars to be fermented and turned into acid and can be made from any fruit or anything containing sugar, really. Wine Vinegar. Whether it is white or red, wine vinegars are extremely common and the base in many popular salad dressings, like Italian. Cider Vinegar. Most of the time you can use apple cider vinegar as a substitute for wine vinegar and any version can be great when you’re making barbecue or mustard. Rice Wine Vinegar. This is a sweeter and lighter vinegar. It pairs very well with asian foods and is great when you want to make something less heavy. Balsamic Vinegar. A popular vinegar, this one is often aged to intensify the flavor and can be used as a reduction to accent other dishes (Try this recipe for Pork Chops with Nectarine + Basil Relish a shot). Distilled Vinegar. Distilled vinegar is often used as a cleaning agent because it has a very harsh flavor to it. Rarely will you find a recipe that calls for it, but if it does, you can bet it will pack a punch. Malt Vinegar. Popular for dipping french fries in, this one is more often used as a condiment than anything, but it can work nicely in a vinaigrette when paired with a salad that has strong flavors. Like I mentioned before, there are many different types of vinaigrettes out there, but the thing that makes them all the same is that they are emulsified – meaning that there is an ingredient in them that allows for the integration of two liquids that don’t normally mix – in this case, oil and vinegar. Through the process of whisking, these liquids are broken down into tiny particles that the emulsifier is capable of holding together as if they are bonded. While with most vinaigrettes this is only temporary, a good emulsifier can make all the difference in the quality of your vinaigrette. Prepared Mustard. This is the most popular. I recommend using dijon or whole grain because they provide the best flavor, but it can be a little strong. Ground Mustard / Mustard Powder. I like to have this one in my pantry because I feel it often has a less dominating flavor than it’s prepared counterpart. Egg yolks. This brings up a whole world of things to consider, and “technically” a vinaigrette bound by an egg yolk would be a type of mayonnaise, but it definitely gets the job done and gives the most cohesive results. Other. These are commonly used to emulisify, though don’t keep a hold of the ingredients for as long as the three listed above. Garlic Paste – this is best achieved with fresh garlic, and you want it as smooth as possible. The emulsion won’t last long, but it works. Miso Paste : a type of soybean paste, this one is very pungent and salty, so make sure you use it with a strong salad. Anchovy paste : It is, after all, how Caesar dressing is made. Now that you have your 3 main ingredients picked out – let’s go over the method for how to make a vinaigrette! In a bowl, mix together your acid, emulsifier, and any other flavoring that won’t be damaged during the whisking process (like shallots). In a steady, thin stream, slowly drizzle in the oil while vigorously whisking. If you pour too quickly your dressing will “break”, meaning that the emulsification process was unable to occur. Once you find that you have created an emulsification (about 1/3 of the way through your oil) you can pour a little faster or a little heavier. Finish it off with any herbs or seasonings, and toss on your salad right before serving. Due to the weight of the vinaigrette, it can cause leafy greens to wilt and can also make your salad look tired and sad if you’ve put too much on it . It is always best to dress a salad right before serving. TIP: The best way to toss a salad is by hand. You’ll be able to feel if your vinaigrette has adequately covered your salad, and it prevents over-tossing and bruising your greens with harsh utensils. If you want a stronger emulsification, you can use a blender instead of whisking by hand (similar to the blender method of making a hollandaise) This is great if you’ve chosen to use a purée as a base, since you’ll likely be using the blender already. If you choose this method, make sure to use an oil that can withstand the friction of blending, and pulse in your oil or blend for as short of a period of time as possible. A blended vinaigrette will have a thicker consistency (more like a smoothie, or the salad dressing from Olive Garden) and will last in the fridge, emulsified, for about 2 days. Thanks so much for stopping by! I hope you enjoyed this in-depth (sorry it’s so long) explanation of how to make a vinaigrette. Do you have a favorite vinaigrette you make? What are some ways you use vinaigrettes that isn’t on salads? Tell me about it in the comments or show me on social media – @foodabovegold. Make sure to show off your mad skills to everyone with the tag #CallMeMichelin! Love this post. I am like you – I get bored very, very quickly with the same old salad. You’ve given me lots of different ideas that I’m going to try over the next few weeks. Homemade salad dressing is always so much tastier than store bought. Thanks Mackenzie! I like to try my own salad dressing, here I get plenty of option. Really interesting !